Chromebooks work best as always-online devices, and even though Google’s laptops still pack quite a few useful offline features, skating by with your Chromebook’s offline tools is ideal only a temporary fix. Finding an active mobile Internet connection shouldn’t be too difficult for many people—the real trick is making sure you don’t blow your data cap in short order. 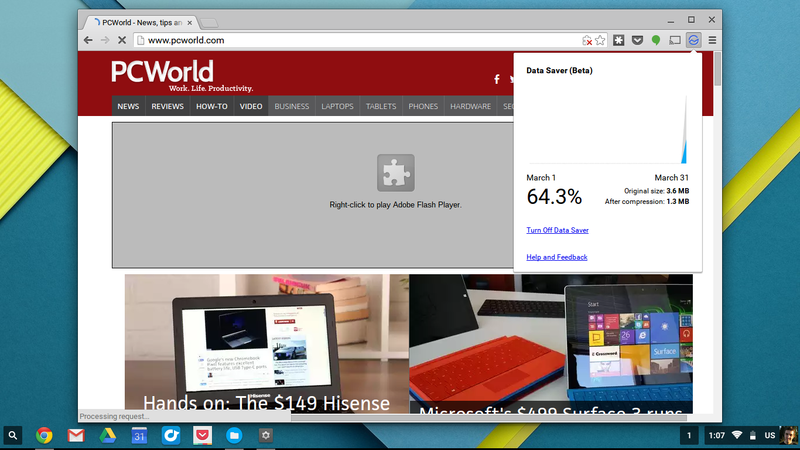 Google just launched a new Data Saver extension for Chrome, allowing you to reduce browsing bandwidth on a Chromebook (or any other device running the full desktop version of Chrome.) This will come especially in handy when you’re connecting your Chromebook to a mobile data network. Here’s everything you need to know to get your Chromebook online with a cellular signal, from basic connectivity to browsing considerations and tricks. Do you want to get online from anywhere with only your Chromebook? Look for Chromebooks with built-in 4G LTE data connections. The exact Chromebooks on offer with 4G data tend to vary. Currently, it’s easy to find HP and Asus Chromebooks that include mobile data connections capable of connecting to Verizon’s network. But you’ll have to sign up for a two-year contract or month-to-month payment for that data from Verizon. The original Chromebook Pixel offered an LTE option, though its successor does not. Other Chromebooks have offered better deals in the past. One of HP’s 14-inch Chromebooks included 200 MB of free T-Mobile data “for the life of your device,” but this model appears to no longer be for sale. Google promised that the extra-expensive LTE version of the original Google Chromebook Pixel would include 100 MB of free LTE data from Verizon for two years, but Verizon actually broke that promise. Google must have learned a lesson because the second Chromebook Pixel doesn’t come in an LTE version. So don’t count on any Chromebook’s free mobile data too much, as it could be yanked out from under you. Chromebooks with included 4G LTE data are nice, but a questionable proposition. The Verizon models require a separate contract, and even the older models with free mobile data only offer a little bit of free mobile data—enough to get online in a pinch, but not to really use unless you pay for more. If another Chromebook with free monthly data pops up for a good price, it may be a good idea to pick it up. Otherwise you may just want to tether. Google also says Chromebooks can use USB mobile dongles—but, curiously, only Huawei dongles are supported at the moment. Your Chromebook doesn’t need to have its own mobile data connection. Rather than looking for one of the handful of Chromebooks with the built-in hardware, you can choose any Chromebook you like. And you don’t need to pay for a device-specific contract or mobile data plan. A cellular-connected Android smartphone appearing as a Wi-Fi option in the Chrome OS network interface. Instead, just use the tethering or Wi-Fi hotspot feature on your smartphone. If your current cellular plan doesn’t include any tethering or hotspot data, you may have to pay extra to get it—but that’ll likely be cheaper than a separate cellular contract, and you’ll be able to get any of your devices online from anywhere. Just enable the Wi-Fi hotspot feature on your smartphone’s settings screen and connect your Chromebook to it like you’d connect to any other Wi-Fi network. To avoid your phone’s battery dying, you can plug it in via a USB cable and it’ll draw power from your Chromebook. Chromebooks also support USB tethering, so when you plug your phone into the Chromebook with tethering enabled, it should connect to the Internet through your Chromebook via the USB connection. This USB tethering should work well with Android phones. Chromebooks can’t tether via Bluetooth, however. This is probably the best option for most people. Just let your phone be your Chromebook’s lifeline to the Internet and worry about the single device’s data plan. Google’s new Data Saver extension for Chrome will help you reduce data usage when tethering via your Chromebook. Enabling click-to-play plugins will also help, preventing your Chromebook from automatically downloading and playing Flash advertisements and videos on the web. Using the Data Saver extension (the white box showing network activity) and enabling click-to-run plugins will save your precious data. Chrome includes settings for many different things—heck, you could even disable all images on the Internet in Chrome’s settings screen to save on data. But the most important thing is realizing your data is being metered and planning accordingly. That means avoiding videos, music, and big downloads. If you really only have 200MB of free data a month, be sure to make it count and only use it in a pinch.